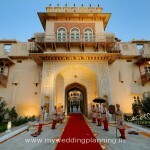 Blend of Rajput, Mughal and European Style. 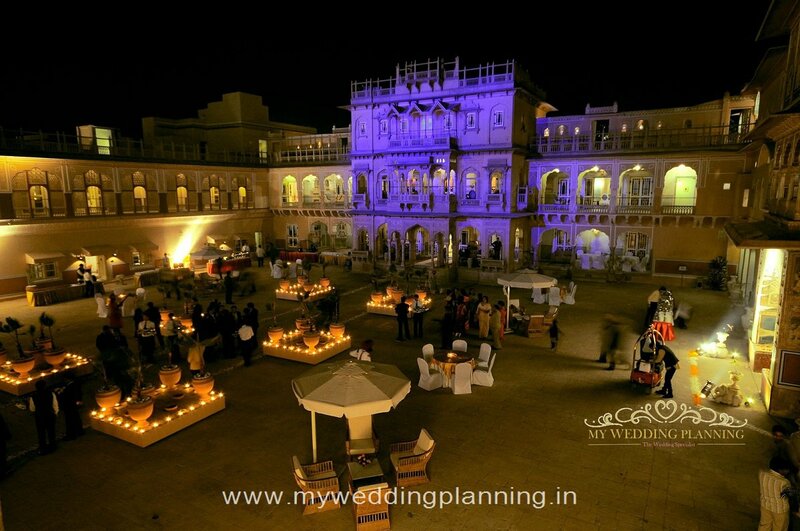 Delight your wedding guests, as you step towards marital bliss in this Royal Heritage wedding venue. 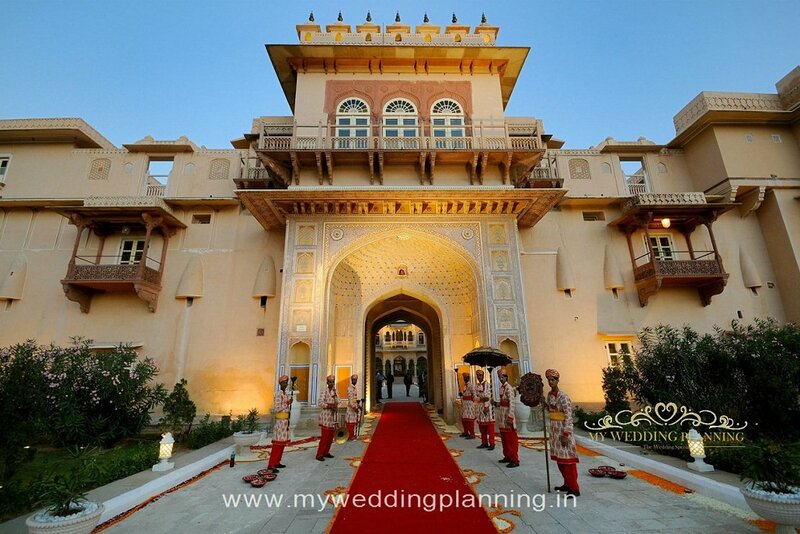 The architecture of the Palace thus has been influenced in many ways by the culture and styles of the reigning Monarchy over 150 years and represents a rich Blend of Rajput, Mughal & European aesthetics, traditions and philosophy. 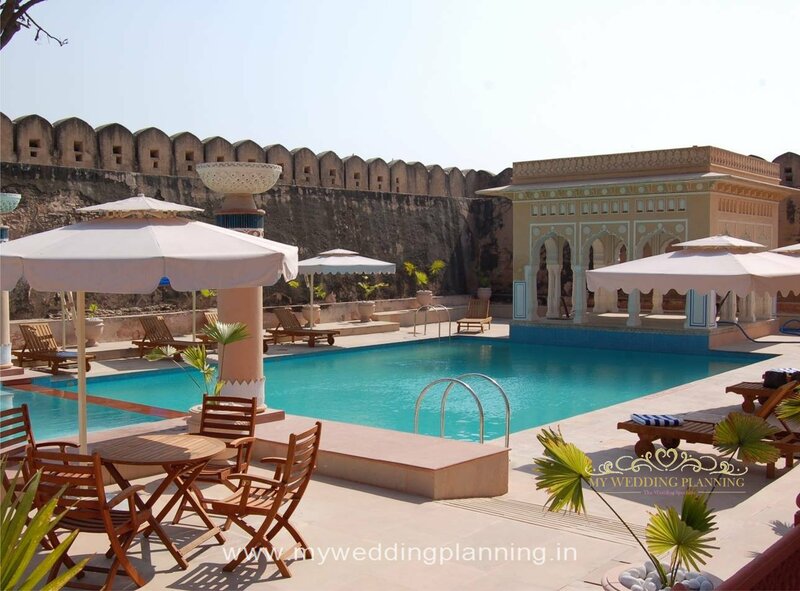 Chomu Palace, the erstwhile Chomugarh Fort built by the descendants of King Prithvi Raj Chauhan is steeped in history, with an individual and unique Architectural style and character. Chomugarh fort, initially was strategically built to house the armies and chiefs with a 5 meter thick outer protective wall to ward of invaders / enemies. 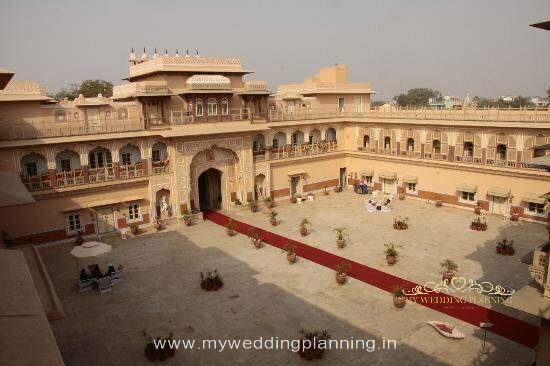 From the time of laying the foundation in early 16th Century till its transformation from a Fort to a Palace in late 18th Century, Chomugarh witnessed close to 200 years of architectural evolution. 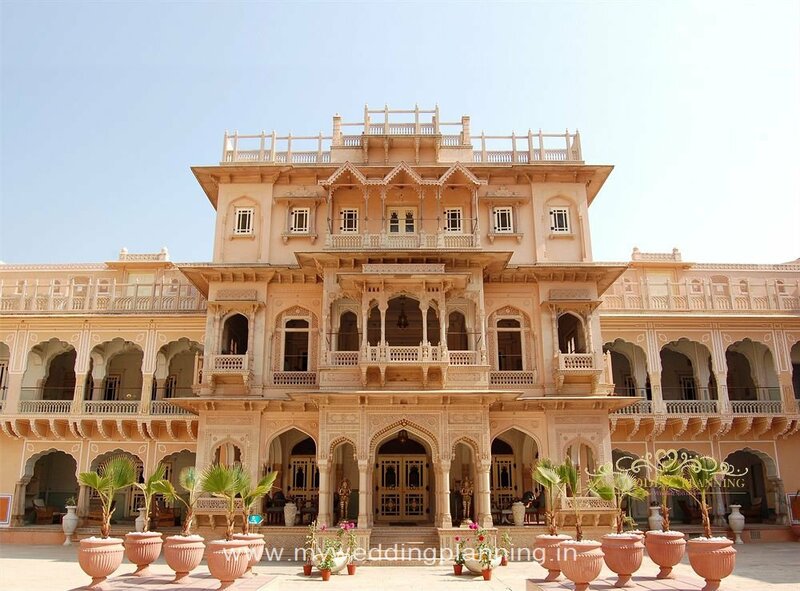 Unlike many Heritage hotels where the interiors imitate contemporary city hotels, Chomu Palace has been painstakingly restored to retain its original character and provides a realistic window to the Luxury, Elegance, Regality & Traditional Lifestyles of the Rajput Royalty. The hotel has also been restored as to offer the best in terms of comfort, with all modern facilities and blend modernity with tradition. Located on the National Highway 11, at a distance of 270 Kms from Delhi; the Palace has been carefully restored in all its elegance and regality, traditional luxury and majestic grandeur. The hotel with 58 Suites subtly blends aristocratic ambience, old world hospitality and contemporary style. Each Suite is designed with heed to minutest detailing. Its royal antique furniture, marble bathrooms, luxurious toiletries, offers an unparalleled experience in luxury, nobility and old world charm. Darbar Hall – The Fine Dining Restaurant, set in luxurious surroundings, creates Magical Gourmet Fares utilizing Aromatic Indian spices, Modern cooking techniques and Age old Recipes. Sheesh Mahal – The Lounge Bar, adorned with Ornate Glasswork, Crystal Lights and Intricate Fresco work on walls, exudes sheer grandeur and marvel, a reminder to the rich & vibrant lifestyle of the Royalty, and offering the finest collection of wines & spirits. 2 Maharani Suites – Maharani suite will cost a special tariff of Rs 25550 per night as against the published tariff of Rs 51000 per night. 12 Historic Rooms– Historic Rooms will cost a special tariff of Rs 6300 per night as against the published tariff of Rs 30000 per night. 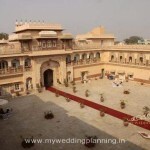 25 Royal Rooms – The Royal Rooms Cost Rs 6300 as against Rs 20000, the published rate. 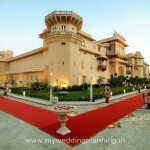 If you book all the rooms in the palace for 2 nights it should cost 8.5 Lakhs to 9 lakh rupees. This rate includes buffet breakfast as per Chef’s Choice Menu at Darbar Hall and inclusive of current applicable taxes on Single / Double / Triple occupancy. The number of rooms on triple occupancy need to be confirmed as all the rooms cannot take Extra Bed and only an extra mattress can be provided. The check in and checkout time is 12:00 noon, however the rooms can be offered before 12:00 noon purely subject to availability. a) Tea / Coffee maker provided in each room, (replenishment as per hotel policy). b) Buffet breakfast for all resident guests at a pre designated restaurant / venue. The above rates are offered on Bed, Buffet Breakfast inclusive of Taxes basis only. All expenses incurred on In Room consumption & facilities / F & B / Venue Charges / Décor / Additional Electricity Load / outsourced facilities / Additional arrangements beyond the scope of this contract, shall be charged and as per actual. Kindly note, all Room / F & B arrangements shall be on minimum guaranteed number of persons and the hotel shall be billing on the same in case there is any reduction. Also, should there be an increase (not exceeding 10% of the numbers mentioned), the hotel shall be charging additionally as per the rates mentioned per person. The Buffet breakfast at a pre designated restaurant / venue, for the guests staying in the hotel is part of the package included in the Room Rates confirmed. Any / all, in room facilities availed, including breakfast / F & B etc through Room Service shall be on chargeable basis and as per actuals. a)The service for all the functions will be a buffet service. b)The hotel will provide table / chair with white table cloth and white covers, white napkins, stainless still cutlery, normal glassware and normal frilled buffet without canopies. c)Venue of each function should be decided within 10 days of signing the contract. All alcoholic and non alcoholic beverages will be provided by the hotel at hotel banquets rates. a)Any items ordered through room service, restaurant and bar will be chargeable as per the hotel menu rates. There is no discount on the menu rate. b)The basis of counting the guest will be the Breakfast/ Lunch/ Dinner plate count on the buffet. The guaranteed number of guests, that many plates would placed. For any additional plates, the hotel representative will ask the Client or his one appointed representative prior to adding more plates. c)Please note that hotel’s liability for catering is up to the “Expected Number” of guests, the figure for which should not exceed the “Guaranteed Number” by more than 10%. If it exceeds the expected number, however the hotel will endeavor to cater but may not be able to provide consistency in quality. 25% of the Total anticipated billing at the time of confirmation. Balance payment at the time of checkout at the Hotel via Credit Card. The advance payment once paid are non refundable and non adjustable. If the signed contract and payment are not received by mentioned dates, the hotel will have the right to keep rooms worth the money in hand and release the balance rooms. Verbal instructions for this booking other than mentioned in this contract, from General Manager, CHOMU PALACE HOTEL or from Delhi Sales office or anyone else WILL NOT BE ACCEPTABLE AND FOLLOWED. Any changes in instruction to this contract have to be written on this contract and signed by you or the ONE contact person authorized by you. After signing of this contract CHOMU PALACE HOTEL and Mr ………………., will stand mutually committed to each other for the Room Nights as per point A. Even if lesser room nights are occupied by your guests other than the Room Nights as per point A, due to whatever reasons, Client ,will still have the payments made for the Room Nights as per point A and For guaranteed food & beverage covers as per point B. 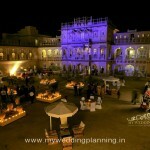 1) It is presumed that the client is organizing all wedding related decorations at their own cost. No decoration structure can be hammered in to the walls, floors, lawns or anywhere else, whereas the necessary advice for proper decoration will be extended from hotel. 2) The client needs to provide the naming list with the allocated room numbers as per the client’s choice to the hotel at least 7 days before arrival. 3) Hotel provides electronic safe facility in all the rooms for the resident guests to keep their precious and valuable items. It will be the guest’s responsibility to take care of their valuables both inside and outside the guest room. The hotel management will not be responsible and answerable for any loss and damage of any precious and valuable items. 4) Hotel has no valet parking arrangements. Cars can be only parked by the guest or by their own drivers at the available space outside the hotel. Guidance for parking of the vehicles will be provided by the hotel. The management will not be liable and responsible for any theft, loss or damage of guest vehicles during the event. 5) The client will be liable for any damage caused to hotel property or equipments by the client or the client’s guests attending the events or by the event Management Company or vendors. Any loss and damage to the hotel will be charged to the client. The hotel team will guide them for proper decorations etc. to avoid such losses or damages. 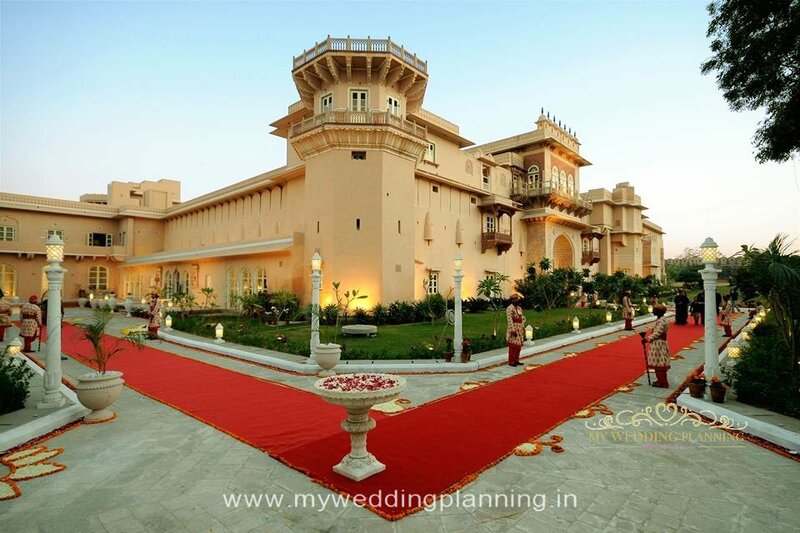 6) The Event Manager or wedding organizer has to provide us the complete plan of their work schedule to avoid any confusion before or during the function. 7) If required the hotel can provide services of ironing men @ Rs 2500/- per ironing man per day on chargeable basis. 8) Any audio visual equipment required would be charged as per rates applicable. 9) As per the Government of India rule, smoking in public areas are prohibited, though specific areas are marked for the guest who want to smoke. 10) The client shall obtain all necessary licenses and permissions to publicly play any musical works during the events by D.J/recorded music. The hotel does not have any license of IPRS (Indian Performing Right Society), PPL (Phonographic Performance License), T-series and more such companies. 11) Music will be allowed till 10 PM in any open area as per the ruling of the Honorable Court. 12) Name and 24 hours telephone number of one contact person representing you is required for the hotel to co-ordinate with on all matters for the guests in house. 13) All Residential guests need to carry an identity card for reasons of security. 14) The host/event company has to organize their own genset for electric supply for the decoration, DJ etc. The hotel will only provide the normal lightings as is where are. 15) Tea/coffee makers are provided in all rooms which is on complimentary basis. 16) Safe deposit lockers are provided in almost all rooms except few. 17) Fruit basket will be provided only in Maharani Suite and Maharaja Suite. 18) Welcome will be done by aarti and tika on arrival. 19) Hotel provides empty minibar during the stay. 20) Hotel does not provide bathroom slippers and bath rob during the stay.